I always wanted to be a writer, from my earliest memories, and I wrote a lot when I was growing up – including poems, short stories and a novel when I was 17. I studied English Literature at university, but I became aware of how much I wanted to explore the world and understand it, before trying to express something about it in a book. I see writing as having two parts – the first is the direct experience you draw on to write your books; and the second is the writing skill itself. I have a favourite writing quote – it takes 20 years of living before you have something to write, and another 10 years to learn how to write it. What life experiences gave you the confidence to start writing? After university I moved to New York and worked on Wall Street for a law firm, and also for the United Nations. This was such an exciting time when I got to see the financial centre of the world – something I had no idea about as a literature student and book lover. After that I moved to Ukraine and started a business, so I built on what I had learned in New York, and I experienced life as an entrepreneur in an emerging market country, which was incredibly interesting. I also had two children, which opens up a completely different range of experiences. At a certain point though, I felt that it was time to return to writing, and to start working on my skill as an author. I knew it would take some years to get to the point where I would be confident enough to present something to the world, so this was a whole new journey in itself. What is The Woman Behind the Waterfall about? The Woman Behind the Waterfall is about a mother who lives in a remote village in the west of Ukraine. She has had some hard experiences as a teenager and she’s trapped in a depression and unable to see happiness in the world. However, she has this wonderful seven-year-old daughter, Angela, whose natural viewpoint is to see everything as happiness. The novel is about what happiness is and how we achieve it, especially as we get older and life knocks us around more and more. It’s also about the patterns that our mothers pass on to us, and the generations of women and the footsteps that we follow, and the paths that we choose. At the time I was writing the book, I was at a major crossroads in my life, and I was really interested in the questions of how much we choose our paths, or just follow what our mothers have done; of what happiness is and how to construct our lives so that we are happy as much as possible. It was especially interesting as I have a daughter, and wondering what choices she will make, and how she will find happiness in her life. These were the questions which I was living when I wrote the book, and I tried to explore them though the characters in the book. The Unity Game is a literary fiction and science fiction novel, with a few other genre elements mixed in. It is set in three locations: New York City, a distant planet, and an after-life dimension. It follows three story lines which deal with similar themes, and the story connects in the grand unity game, which is revealed towards the end. It is quite experimental, and has a lot of ideas in it. In the end, I hope that it is uplifting and makes my readers think differently about the world, and about their lives. It sounds very different to your first novel. Would the same readers enjoy it? My first novel, The Woman Behind the Waterfall, was dreamy literary fiction, and I channeled a lot of personal emotion and experience into the book. With my second novel, I didn’t want it to be personal at all; and I wanted to explore a lot of ideas I had, and some different genres. I have heard that writers often make their first novel very personal, and their second novel very ambitious, so I think I am following the trend! The Unity Game is much faster, more exciting and experimental than The Woman Behind the Waterfall. So far as readers, I think it will appeal to anyone who likes literary fiction, and in particular people who like science fiction and experimental fiction. It should appeal both to men and women equally. I think the closest reading experience would be David Mitchell. He juggles so many genres in his books, but his readers just love the outpouring of ideas and great writing. His readers would be my ideal audience. Which writers have most inspired you? I especially love the modernist writers such as Virginia Woolf and James Joyce, where a single page of the language can be read and re-read over years and still astonish you with the skill and imagination of the prose. For contemporary writers, I love Michael Cunningham (not only for the Virginia Woolf connection), and writers bursting with energy such as Jonathan Lethem. I also love Aimee Bender’s work. Perhaps my favourite for a long time has been Haruki Murakami though. He inspires me to be braver with my writing and to reach through to ideas and possibilities that I’m not aware of yet. … but they are there! I certainly do! I really love science fiction writing when it is also literary fiction. My favourite is Stanislaw Lem’s Solaris which is overwhelmingly brilliant. Ursula Le Guin’s Left Hand of Darkness is also timeless. For newer writers, I am a huge fan of Ken Liu, who I think is one of the best authors of this century, for any genre. Through him, I also came to Cixin Liu’s The Three-Body Problem – another great work. Science Fiction is amazing because there are no limits to where you can let your imagination go. And when wild ideas are combined with disciplined, brilliant writing – you get a masterpiece like Solaris or The Paper Menagerie. For The Woman Behind the Waterfall, I was living in Ukraine when I started the book, so I was already familiar with the country and the different regions. When I had completed my first draft, however, I found there were a lot of details I needed to check. A friend of ours, a Ukrainian orthodox priest, took me round some villages in western Ukraine and I got to ask my many questions to different people. I had a very fun lesson in making – and drinking – samohon (Ukranian home-brewed vodka) and hearing some of the amazing stories the older generations in Ukraine have to tell. It is truly a country full of extraordinary untold stories. I hope to return there one day for another novel! For The Unity Game, the New York part needed the most research. I had lived in Manhattan for several years, and had written the entire section from memory, but I had to go back there and check all my details. Google Street View is very useful nowadays, of course! One of my characters dies in the first scene and finds himself in an after-life dimension, so I did a lot of reading about after-life experiences and beliefs. That was very fun. And one of my characters is the philosopher Socrates, so I had to read some Plato and some biographies. I didn’t have to do too much research for the Science Fiction part – mainly I had to make sure I wasn’t repeating an idea that had already been written about. Where / how do you write? I live in different countries around the year, depending on children and other responsibilities, so I’m lucky enough to have a lot of flexibility in how and where I work. For writing the first draft of a novel, I like to be in a café. It’s great to be surrounded with people I don’t know, so I can drift off into the possibilities of their lives, and the different worlds we all live in. For the editing stage, I need to be at home with a big table where I can spread out my ideas and notes. It’s possibly the most challenging job for a fiction writer – to stay on top of the thousands of ideas which are sparking up all the time, and the sudden revelations for character, structure, new scenes, which can appear at any minute – in a dream, or on a bus. What’s next for you? Have you got another book coming out soon? I’ve released two books in two years, which was the result of at least five years writing previous to that. Now I want to get back to writing and experiment more with forms and genres. I hope to have a new novel out in a couple of years, and maybe some short fiction before then. 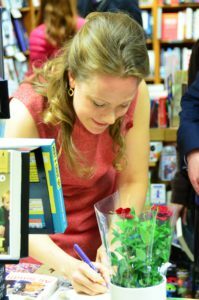 I blog about writing and themes around my novels at www.leonorameriel.com/blog. I’m very active on Twitter – @leonora_meriel and I have a Facebook author page – Leonora Meriel Writer. I do book clubs readings and talks as well as literary events which you can follow on the News section of my website – www.leonorameriel.com/news-and-events. I have a mailing list which you can sign up to here. If you want to write to me directly, I am always happy to hear from readers at leonora@leonorameriel.com.